Want made up words? 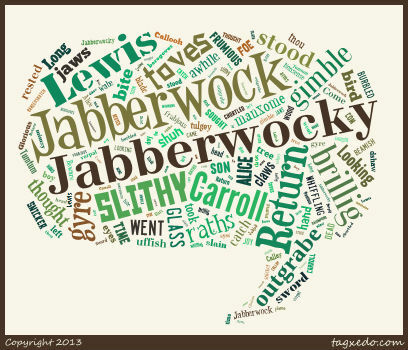 Lewis Carroll got made up words! When it’s packed, the mess is gone, and I can go and write. (Can you guess?) Then, of course, we had to condense it down to one word. One word? The man is crazy, I thought. Then he uttered the magic phrase… “If there isn’t a word, you can make one up.” (Or something like that.) Awesome. It came to me almost straight away. Now, I could have gone with ‘neat’ or ‘clean’ or something like that . But none of those words conveyed the sense of satisfaction I have at achieving a kitchen that doesn’t have dirty plates and used saucepans scattered over every surface. For some reason, if my kitchen is messy, I feel like my mind is cluttered. Words like ‘tidy’ give you a sense of the end product, but they don’t describe the journey. My word conveys (to me, anyway) a sense of my active participation in achieving that state. And there’s the rub. If you’re going to go making up words, you run the risk of creating something that’s meaningless to other people. Words like ‘squared-awayness’ probably don’t carry that kind of risk, because I’ve picked something that already carries meaning and just levered it into a grammatical convention that makes it one word instead of two. 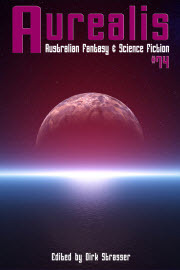 But, especially if you write speculative fiction like me, which often involves making up worlds and cultures, you might want to make up new words, just coz they sound cool, or there isn’t quite the right word to convey what you want. In this case, you’re going to have to rely heavily on context to get across your meaning, or you can leverage off existing words that sound similar. ‘Frack’ as a pseudo-swear word is a good example of this, although thanks to the Australian coal-seam gas mining industry, that word now has a boring and slightly depressing, well-understood technical meaning. So there’s your second risk. You might end up with a word that means something different to other people, to what it means to you. Here’s a couple of examples from one of my works in progress. This has a late-medieval-ish setting and a lot of the characters are peasants, or common household or forest-dwelling fairies loosely based on various bits of British folklore. I’ve tried to create a kind of vernacular for the story to give it a certain feel. But, here are two of the inadvertent missteps I’ve made along the way. What I meant: a variant of lumpy, but with a more colloquial sound to it. What it actually means: (according to Dictionary.com) of or pertaining to disenfranchised and uprooted individuals or groups, especially those that have lost status. It can also mean stupid or unthinking (how’s that for irony?) and comes from the German word for vagabond. What it actually means: the sky. From the Old English welcn and related to the German word Wolke, which means cloud. Who knew? Well, one of my sharp-eyed, German-speaking beta readers, that’s who. So the moral of this story is: be creative! Make words up. But you might want to double check to make sure you’re using something that, well, means what you think it means.